NOTE: This is NOT the current edition of Savage Worlds. 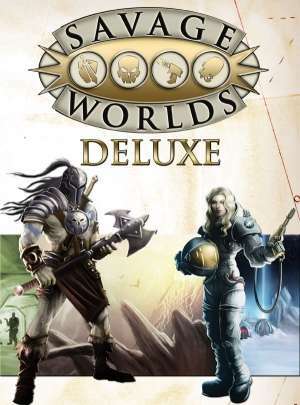 The current version is the Savage Worlds Adventure Edition. What races are in this, and how does this compare to D6 Fantasy? What rules system does this use? Is it a D20 platform or its own set of rules? I'd also like to know what rule set this uses. Savage Worlds is its own system. Attributes and Skills are rated as dice - d6 Strength or d8 Guns. Players usually roll a Skill die and a "Hero Die" (d6) using the highest result. 4+ is a success with degrees of success for high rolls. The dice "explode" - re-roll and add if you get the highest value on a die. It has "Hero Points" (Bennies), stunts/feats, and levels, but no "classes" (you can take level ups that give you the basics of a class/prestige class but they aren't required). One thing that is a little different about it is PCs are pretty fragile but the game is designed for characters to lead "supporters" (NPC followers/allies) into battle. There are plenty of tweaks, hacks, and setting-specific rules allowing PCs to function more like other RPGs though. Initiative is also based on playing cards. It's a fun system that plays pretty fast. It has plenty of fans who love it and you can find settings that customize the game for just...See more about any genre. Is there a DLC Character Sheet for this product? This title is listed as 'PDF', not 'Watermarked PDF'. The downloaded copy, however, is watermarked. This needs to be fixed. Is this the book required for Rifts Savage Edition? Yes Right, this in US Letter format or the explorer edition in "paddigest" format (same format Savage Rifts books). Does this include the new recover from Shaken rule? This is precisely what I came here to find out. So, does anyone have an answer? I just bought the PDF and noticed that the June 12, 2015 update has a broken ToC. For some reason the chapters are nested under other other headings. For instance, Chapter One appears under Savage Settings, Chapter Two is under Advancement, etc. Only the Introduction chapter appears top-level. This makes it kind of hard to navigate within chapters. I second that. The table of content is correct if you look only to the paper, but if you look at the PDF navigation, it's totaly broken. When I printed the PDF it happens that what should be on two different pages (one left and one right) is in fact on one side and on the other side of the same page. And so, the page numbers are on the inside of the book. I'm very disapointed. I wrote to the editor and the PDF was updated. Now it's fixed. If you're using Acrobat, for viewing in two page view, uncheck the option View»Page Display»show cover page in two page view. For printing, start with page 2... then print the cover separately. Hi, does the latest version of this PDF include the errata, like the printed explorer edition ? Thank you! I was really starting to wonder what the difference was before I buy one or the other. This title was added to our catalog on June 28, 2011.